As I’ve recently made a number of long train journeys on the Chinese Railway system I thought it might be useful to record some information that might make it easier for others to do so in the future. At times doing anything independently in China can be daunting but perhaps up-to-date information, without (hopefully, too much) negativity will help ease the pain. What makes China difficult is the language, the lack of signage that helps when you really need it and the seeming impossibility (at the times you most need it) to find out where to go for the information you are after. 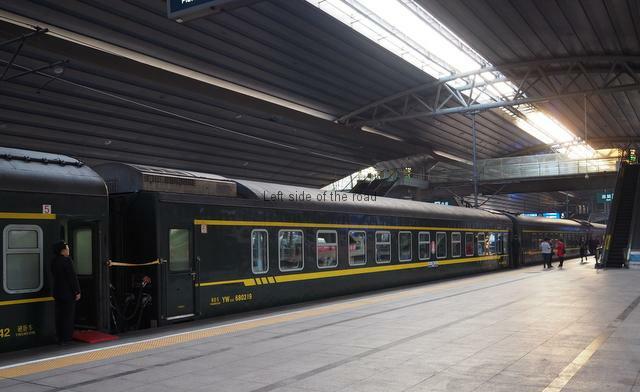 Perhaps the first thing to mention about train travel in China is the fact that the railway stations are becoming vast, huge structures that make European main line railway stations look like small town stops in comparison. Although older stations were big those that are being built now dwarf those of the past and can become a problem for unwary travellers. Added to this is the increase in the number of indigenous travellers (the reason for the huge stations) and a perceived security threat which means that both persons and luggage undergo a check before anyone can enter the main building concourse. 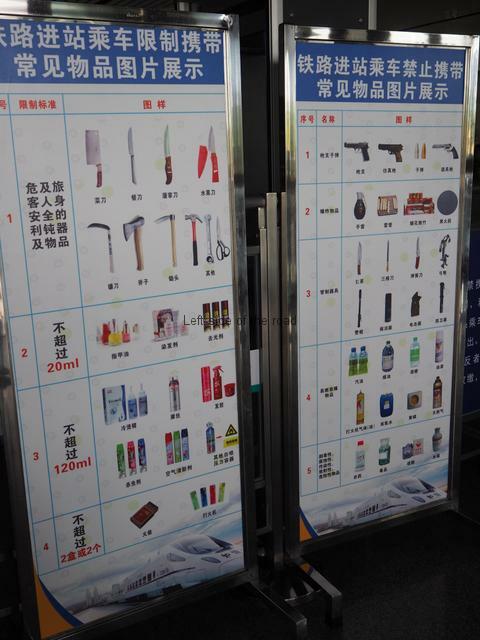 (Similar, but not as vigorous, security checks also take place on all the stations of the Beijing Metro system.) This can lead to long queues to even enter the station before you have to look for, and get to, the relevant waiting area/platform. The process of buying tickets has improved vastly in the last few years – thanks to the internet. 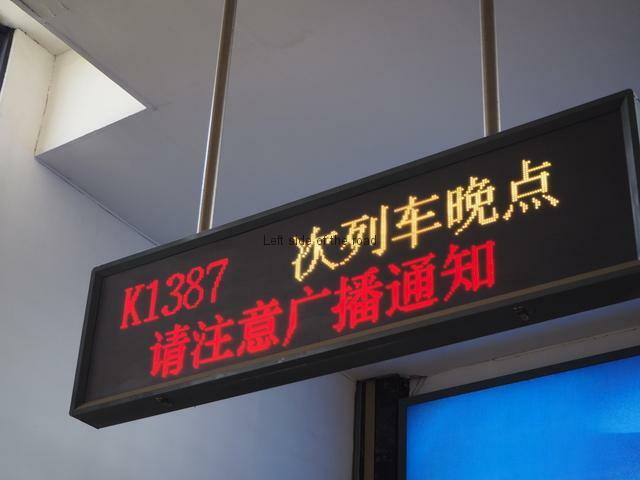 The queues in railway stations used to be interminable – and can still be long – and the system was very confusing (and lack of anything other than Chinese characters over the windows didn’t help). Now you can find out timetables, book and buy tickets on your own computer/smart phone. One site I’ve used with no problems whatsoever is Ctrip. You pay a percentage commission on the ticket price but it saves a lot of problems and the commission is not that great – Chinese railways being relatively cheap compared to those in western Europe. There is, however, the matter of picking up the actual ticket itself which can be very dependent on the location of the station – some seem to be better organised than others. If you are faced with a seeming infinite number of ticket windows and you haven’t encountered a friendly and helpful staff member then look for a sign in one of the windows that says ‘The dining time is 12.30 – 13.10’ – in English. The actual time might differ slightly but this is the window to which foreigners were directed in the past, before the advent of internet booking. (In Guangzhou Station, for example, this is window 82 in Ticket Office No 3.) Present the printed out voucher (or whatever is on your phone via the app) – a 9 digit number preceded by an E – plus your identification, normally a passport, – a photocopy will do – which has the same information that you filled in at the time of booking. This process shouldn’t really take that long, it all depends on the queue so it makes sense to arrive at the station in enough time to take account of contingencies. As even the locals are using the internet for booking tickets there are more and more automatic machines being installed in the major stations. Unfortunately all the instructions are in Chinese and you have to present your ID to an electronic reader. I doubt whether it would accept a foreign document. The installation of these machines is the main reason that queues for tickets no longer go around the block. The ticket office is sometimes outside of the actual area identified as secure – it seems to very much depend upon local preferences – but be prepared to show ID to enter to get your ticket (and depart if on another day). At some time before getting on to the actual concourse you will have to go through a security scan – of both yourself and your luggage. This might also be before or after your ticket has been checked, either manually or by a machine. I’ve not come across any standardisation in the process. 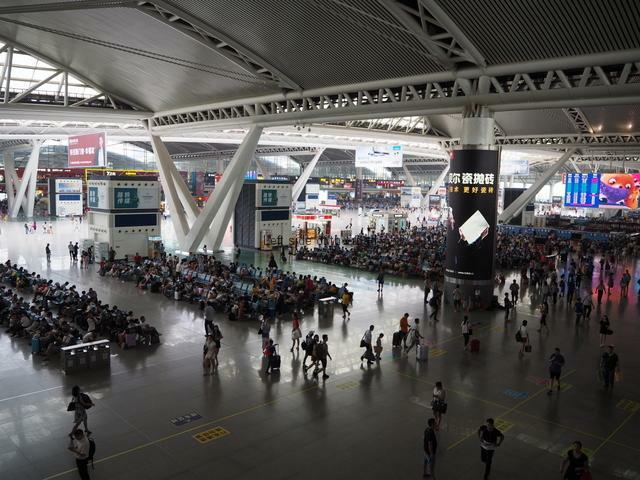 However, it doesn’t normally take too long as there are enough people to process the crowds that go through major Chinese Railway Stations. You will all have read or heard about the ‘greatest migration in human history outside of war’ that takes place every year during the Spring Festival (Chinese New Year) but that movement goes on every day in numbers which are unimaginable in Europe. Once on the concourse you can normally forget any helpful signs in English and you have to depend upon your own wits and common sense. It seems as if all the signage up to now has been designed with the distinct aim of trapping you into a sense of complacency. Apart from anything else watch what others do – and on your first time through a station arrive in plenty of time so you can learn enough of the basics without getting into a panic as the clock ticks. Use the combination of the train number and the time to identify your particular train and to learn the number of the platform. The barrier in the waiting room won’t be opened much more than about 20 minutes or so before the train’s scheduled departure time. Once it does there will normally be a stampede but as seats are allocated you don’t have to join the rush – as with the rush to get on planes this panic is so that people can store their luggage in the limited space. Depending upon the age of the station there will possibly be two gates, one with a blue notice and one with a red one above them. These refer to the colour of your ticket. Blue is for the vast majority of travellers. The red is for those who have requested some sort of special assistance or who fall into the category of being accorded a privileged status. This includes the elderly and the disabled. As a foreigner it would not be considered amiss if you counted yourself in this category and would normally pass through the red channel without difficulty. In China foreigners are considered to be not quite complete people and together with the idea that you are a guest in their country this situation creates a strange relationship. The red tickets are checked manually and the blue (normally) go through the automatic gates. The gates are likely to close 5 minutes before the train’s scheduled departure time. Although, from my experience, the trains in China are quite reliable I did encounter a couple of cancellations. That would have been less of a problem if I had been able to understand the signs. If you see something similar to that in the picture below, or a board with a paper sign appears the other side of the barrier where you expected to leave, then head straight to the booking office to exchange your ticket for the next available train. Any delay might mean you will find that seats are limited or non-existent on the next train to your destination. Although the railway company must know of these cancellations long before the train is due they tend to leave any notification of this to the very last minute. Once through those gates the ticket will not be checked as you get on the train UNLESS you have a sleeping berth. That ticket will be checked by the attendant standing smartly to attention at the door of the carriage. In the sleeping carriages, soon after departure, you will hand your ticket to the attendant and you will be given another card in its place. This is so the attendants know exactly where you are getting off. This can be very handy if you are due to arrive at your station at three o’clock in the morning. You effectively get a knock up call just in case you oversleep. The returned ticket will then allow you to exit the station. At intermediate stations the passengers who are leaving the train will get off before the new passengers are allowed on the platform – at least at the larger stations and cities. This avoids any mad crush as people rush for all available space. It might be worthwhile here emphasising that there’s no real notice given about when the train will depart – for example there are no announcements made on the platform or in the train itself. Yes an announcement will be made (although only in Chinese) about where the train is bound, where it has come from and on which platform it can be found but not its imminent departure. This means that if you are one of those who likes to get off at stations don’t stray too far way from your train so you can keep an eye on departure preparation activity. As we’re on the sleepers some more information. The sleeping compartments are basically of two kinds, called soft and hard sleepers. It doesn’t mean that in the hard sleeper you are sleeping on hard wooden boards, the difference between the two is the soft has four berths and the hard six to each compartment. In the ‘hard’ carriage this makes for a tight squeeze (66 people in total in 11 bays) and seating space is at a premium once everyone wakes up. In the ‘soft’ the space is useable during the day as well as the night without anyone really being put out as the compartments are those that used to exist on virtually all railway systems before the introduction of open carriages. The ‘soft’ compartments have doors whilst the ‘hard’ open directly out into the corridor – so the level of privacy is very different. The difference in price between the two is, very roughly, about 30%. On the other hand a simple seat would cost half the price of a hard sleeper and a third of that of the soft sleeper. The beds will be partially made up when you board. The pillow and duvet piled up at one end – that’s for you to sort out how and when you wish. The temperature is normally quite well controlled in these carriages but you will probably welcome the warmth that the duvet provides in the early hours of the morning, if not before. In each compartment of the soft beds there will be a water flask in a container on the floor and beside that a small rubbish bin. There will also be one power socket which accepts the two small round pin plug and the two or three flat pin plug. You are amongst the privileged in this day and age. Power is at a premium for charging mobile phones and there are no sockets in the seating carriages of the train (apart from the High Speed Trains). That means that after someone has been on the train for any length of time they will be searching for a power socket with the same intensity as a junkie looking for his/her fix. As a foreigner, especially if you are in a carriage by yourself/selves, and the door is open during the day you are quite likely to get asked for access to this source of such importance. 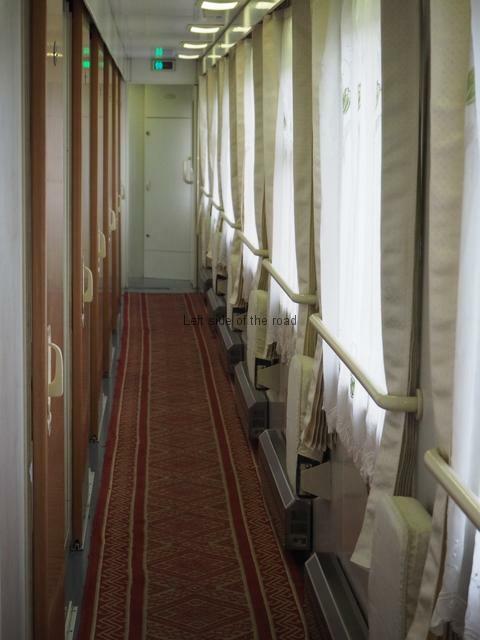 There are also a couple of sockets in the corridor of the carriage and these also get visits from the hoi poloi. However to get power from these sockets you are very much out in the open and are more likely to be chased by the attendants if seen. In the compartments they are more likely to get away with being in a part of the train where they are not technically supposed to be. Whether they get chased very much depends upon the attendants. Travel ‘soft sleeper’ and you are travelling in the small, First Class section of the particular train. Why, when everyone knows that the demand for power is so great that sockets aren’t available in all parts of the train is a question I’m not even going to bother to ask. At the head of each berth there is a reading light so you can continue to read or whatever once the main light has been switched off. From my experience Chinese travellers are early to bed once the train gets moving (the same happens on long distance buses as well) and there won’t be a great deal of movement after 22.00. Each compartment door can be locked from the inside. If you do so you can expect to be awoken in the middle of the night if someone has a berth booked in your compartment. They can always get in quietly by getting the attendant to open the door with their key but someone might be impatient to get to bed themselves. However, the lock does provide a greater security and peace of mind. In the corridor there are fold down seats between the windows. These are useful places if you find the compartment a little claustrophobic and it offers an opportunity to look out the window and contemplate the problems of the world – although this is one of the reasons for undertaking such long distance train journeys in the first place, isn’t it? At one end of the carriage there will be a constant supply of hot drinking water from a boiler. This causes a constant stream of visitors either to make tea or to rehydrate the box of E number chemicals that pose as food under the name ‘instant noodles’. Most such carriages also have a toilet at either end. It’s likely that one of them will be the squat version. Bring your own toilet paper – you should be doing that as you travel anyway. At one end there will be the carriage attendant’s room and next to that will be a wash room with three wash basins and cold water taps. Smoking is not permitted at the seats or in the sleeping compartments on these types of trains (the more ‘traditional’ type compared with the high speed versions now more common on the Chinese railway where smoking if forbidden throughout) but is permitted in the area between carriages so don’t be surprised to get a whiff of the acrid smell of burnt tobacco from time to time. There will be a restaurant car, very likely next to the carriage/s with the soft sleeper berths which are normally in the middle of the train. This was problematic a few years ago as the staff would be reluctant to approach a foreigner if they couldn’t speak any English. To avoid a problem of communication you could be ignored. That has changed now and menus will in English as well as Mandarin and the staff might also be more competent in English. Travellers have to be reasonable in these situations – how many workers on European railways are multilingual, especially in the UK? A simple dish, which includes rice, will cost (in 2017) about 30 RMB – about £3.00. However, if you choose not to go to the restaurant car trolleys constantly ply along the corridor during the whole of the journey selling the sort of cold convenience foods that are found in supermarkets, the likes of crisps and Chinese speciality snacks as well as the ubiquitous ‘instant noodles’. Fruit wrapped in cling film will also make a showing. At recognise meal times (around 06.00, 12.00 and 18.00) one or two hot meal options will be available, freshly made in the restaurant kitchen, for example, hot porridge and noodles for breakfast. If you are keen on alcohol then you have to bring it yourself – it’s not sold from the trolleys that ply the corridors and neither is it available at station stops when there might be more than a few minutes before departure. From my experience they can move through the soft sleeper carriages quite quickly as often many of the doors will be closed so you either have to listen out for them and move quite fast or hang around the entrance of the compartment at meal times. As an example of price, in 2017, a bowl of breakfast noodles, which I thought were tasty enough, was 10 RMB, about a pound sterling. Eating is different on the High Speed Trains. There’s no restaurant as such, the journeys being of a much shorter duration, and meals and drinks will be brought to your seat once it has been ordered from the staff who pass along the carriages. A basic meal and a drink will cost about 25 RMB, about £2.50. There are also power points at each seat – although their location makes using them with an adapter impossible. Free WiFi is also on offer in the soft sleeper area. I found this a bit hit and miss. You connect to the provider on the list that looks like a list of symbols and shows ‘excellent’ as the level of reception. A screen will come up with all the instructions in Chinese but below them is a large green button. I found I had to click on that to get any further. On my journeys the reception was erratic. It will also send alarm signals to your email server who will send security messages to the allocated email address. Virtually all passengers who will be travelling overnight in a sleeping compartment will change into the sort of clothing that they would have if they were in their own homes – in Asia there’s a distinct demarcation line between the ‘street’ and the home. And if only for one or two nights the train becomes the home. So after arriving in smart outdoor clothing most of the passengers will be seen dressed in the likes of track suits – both the men and the women. A pair of slippers or flip flops would also be useful. It’s unlikely that anyone would really have trouble sleeping in the soft sleeper. Apart from the creaks and groans, squeaks and moans from the train carriages themselves you are, more or less, insulated from the rest of the world. That might not be the same in the hard sleeper carriages where there is a higher concentration of people, together with their snores and nightmares. At least there it is dark when people go to sleep, that is not necessarily the case in the seating parts of the train. Wherever you might find yourself there’s a local solution to sleeplessness which also includes an element of local culture. That is to drink the Chinese liquor baijiu. This is, normally, made from grain and is a clear liquid. Normally around 52% proof a couple of these will knock out most people if they have had a long day travelling. There are a couple of hurdles, nonetheless. Some of the cheaper options can smell similar to paint stripper so it’s not a drink to appreciate in the same way as you might a half decent wine. Next is overcoming the first mouthful. You know how strong it is as the lips become slightly numb on first contact. As the liquid passes down the throat the burning sensation lasts only a short time as it takes a small piece of the lining with it. After that it’s plain sailing. A few of these and you will be the one keeping everyone else awake. And it won’t, unless you really want to, break the bank. A bottle of 500ml in a local supermarket cost 10.80 RMB – that’s equivalent to just over a pound sterling. Another ‘essential’ is a box of tea bags. I’m old enough to remember Lipton’s tea in the UK. You don’t see it there at all now but whoever owns Lipton’s doesn’t care as it has an intro in some of the most populous countries on the planet. Why worry about the demise of the corner shop in England when they can sell their products in hundreds of thousands of locations in China with a population of 1.5 billion and climbing. Such goods are ‘aspirational’ for those who want to consider themselves internationalists in the new capitalist China and although the tea might not be as good as that produced for the tea ceremonies it is more than adequate for a lengthy train journey. As stated before hot water is permanently available in the public areas of the train. Another travelling essential is an unbreakable drinking container. I favour the stainless steel cups that are used for water in Indian vegetarian restaurants. Cheap and virtually indestructible when travelling. The network of High Speed Trains is expanding so rapidly in China that the slower way of travelling might be under threat in the near future. But it comes, at a price, literally. For example, on a High Speed Train, the journey from Nanning (in Guangxi) to Beijing will take just under 14 hours and will cost: 914 RMB 2nd Class, 1,379 RMB 1st Class and 2,853 RMB Business Class. 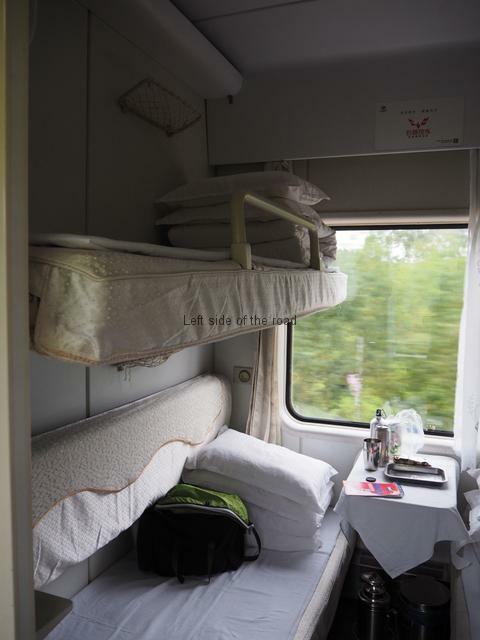 On the other hand the slower, overnight train will take 23½ hours and will cost: 751 RMB Soft Sleeper and 487 RMB Hard Sleeper. It all depends upon whether you are time or money poor. The fast rains have their charm, reaching speeds of 310 Km per hour, but like all high speed trains around the world the experience is sterile and you feel separate from the environment through which you are travelling. This entry was posted in Asia, China, Travel and tagged china, hard sleeper, railway, soft sleeper, train by Michael. Bookmark the permalink. Excellent guide to a potentially confusing system.